The game changer came in 2005, when we saw one of the most active hurricane seasons in US history. Hurricane Katrina, the fifth hurricane of that season, resulted in nearly 1,600 deaths. Almost half of these fatalities occurred in New Orleans: 80% of the city was flooded, at a cost of US$40 billion. When the water subsided, so did the population: ten years on, the city that used to house 500,000 is now home to only 300,000 people. There are a number of ways to go about changing cities to account for rising sea levels: we can raise coastal defences, build houses on stilts, or simply move cities and their populations away from the coast. Which of these strategies works best was one of many questions set out in Climate Change: A Risk Assessment – a new report led by Sir David King and the Foreign and Commonwealth Office. Globally, sea levels have been remarkably stable since civilisation started to develop several thousand years ago. During the 20th century, sea levels rose about 17cm, at an average rate of 1.8mm per year. Over the past few decades, that rate has doubled to more than 3mm per year. This trend is expected to continue and accelerate. According to the latest Intergovernmental Panel on Climate Change report, the sea level is projected to rise up to 1m by 2100. If the large ice sheets of Greenland and Antarctica melted, even higher rises are considered possible, albeit highly uncertain. Importantly, if carbon emissions are stabilised, or even decrease, the sea level will continue to rise for many centuries, as the deep ocean slowly warms and the large ice sheets reach a new equilibrium. Simply put, sea-level rise is here to stay. It is likely to lead to greater flooding, salinisation (the build up of salt in surface and groundwater) and erosion in coastal areas, affecting millions of people worldwide and costing billions of dollars of damage. 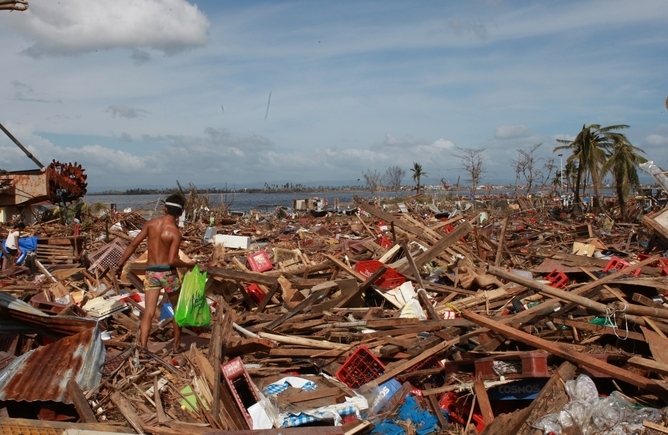 The devastation of Typhoon Haiyan. The high costs of economic damage and loss of life are becoming less acceptable in a world where extreme weather events can be accurately forecast and coastal protection is possible. In many parts of the world, damages and loss of life remain high, as seen during Typhoon Haiyan, which hit the Philippines in 2013. Preparing coastal cities for extreme events and adapting them to cope with sea-level rise remains challenging: King’s report highlights the engineering, financial and socio-political limits of the adaptation challenge. But cities are starting to embrace these challenges. For example, last year, Boston put forward the bold, novel idea of becoming an American Venice – a city full of canals to hold water as sea levels rise. New York has considered building a barrier to keep water out, in light of the fact that, with a 1m rise in the sea level, a 1-in-100 year event (that is, a severe storm one would expect to occur once every 100 years) could become 200 times more likely to occur. London has also developed a range of flexible options that would protect the Thames Estuary against up to 5m of sea-level rise. These include raising defences, implementing flood storage and constructing a new and bigger Thames Barrier further downstream. In developing countries, few cities are preparing for sea-level rise, despite the awareness that this is a long-term hazard. Developing cities also frequently have rapid population growth. In Shanghai and Kolkata more than 400,000 people live less than 2m above the present-day sea level. A rise of 1m will increase the frequency of a current 1-in-100 year event by 40 times in Shanghai, and about 1,000 times in Kolkata. Local ground subsidence is another factor to worry about. This involves the sinking of the land relative to the sea due to natural and sometimes human processes (such as groundwater withdrawal). Local ground subsidence will worsen conditions in about a quarter of coastal cities – namely, those built on susceptible deltaic soils (those at the mouth of a river). Small islands and their cities are also under serious threat from sea-level rise as they are low-lying, remote and dispersed in their territories, and often have limited financial resources. Far from being a green, spacious island, Malé – the capital of the Maldives – is one of the world’s most densely populated cities. Building protective structures is one way of reducing the impacts of extreme events: Malé is surrounded by a sea wall and giant tetrapods (a four-pronged concentrate structure about 2m high). But a lack of space limits future coastal protection. To overcome this, a new island has been constructed, Hulhumalé, with sea-level rise also in mind. The solution to sea-level rise is simply to build upwards: The island was raised to 2m above present day sea level to protect against storms. This buys time, but moving into the late 21st or early 22nd century this may not be enough. Other Maldivian islands are following suit, with the Safer Islands programme selectively raising parts of islands. This may help the parts of the country, but clearly much more work is required to ensure the long-term prospects of this fragile island nation. Ultimately, these case studies show us that there’s no one-size-fits-all approach to adapting cities to rising sea levels. Rather, the best bet for cities to adapt against rising sea levels is to dare to be different. Both engineering design, government authorities and social attitudes must acknowledge that change needs to occur, if we’re to avoid disaster. While there has been significant progress in describing and understanding global-mean sea-level rise, the regional departures from this global-mean rise are more poorly described and understood. In this new paper, which you can view here, we present a comprehensive analysis of Australian sea-level data from the 1880s to the present, including an assessment of satellite-altimeter data since 1993. We find that After the influence of El Niño Southern Oscillation is removed and allowing for the impact of Glacial Isostatic Adjustment and atmospheric pressure effects, Australian mean sea-level trends are close to global-mean trends from 1966 to 2010, including an increase in the rate of rise in the early 1990s. Given that past changes in Australian sea level are similar to global-mean changes over the last 45 years, it is likely that future changes over the 21st century will be consistent with global changes. Here is the press release from my recent paper published in Nature Communications – ‘Time-scales for detecting a significant acceleration in sea level rise’. Scientists from Ocean and Earth Southampton and National Oceanography Centre Southampton have developed a new method for revealing how sea levels might rise around the world throughout the 21st century to address the controversial topic of whether the rate of sea level rise is currently increasing. The international team of researchers, led by the University of Southampton and including scientists from the National Oceanography Centre, the University of Western Australia, the University of South Florida, the Australian National University and the University of Seigen in Germany, analysed data from 10 long-term sea level monitoring stations located around the world. They looked into the future to identify the timing at which sea level accelerations might first be recognised in a significant manner. Lead author Dr Ivan Haigh, Lecturer in Coastal Oceanography at the University of Southampton, says: “Our results show that by 2020 to 2030, we could have some statistical certainty of what the sea level rise situation will look like for the end of the century. That means we’ll know what to expect and have 70 years to plan. In a subject that has so much uncertainty, this gives us the gift of long-term planning. The study found that the most important approach to the earliest possible detection of a significant sea level acceleration lies in improved understanding (and subsequent removal) of interannual (occurring between years, or from one year to the next) to multidecadal (involving multiple decades) variability in sea level records. The findings of the study, funded by the Natural Environmental Research Council (iGlass consortium), are published in this months issue of the journal Nature Communications.